Three roomy cabins, functional galley, saloon and head, plus first class finish give a luxurious feel to this boat. On deck a simple sail plan ensure you get great performance without too much hard work. 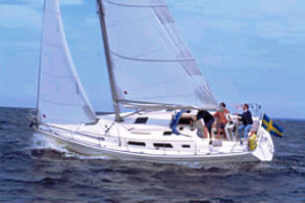 A self tacking headasail adds to the ease of sailing. 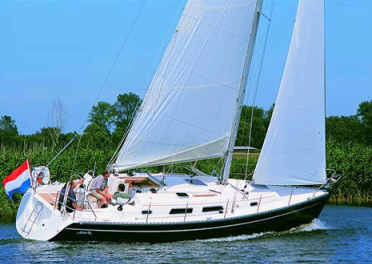 Prices quoted are for a bareboat. Skipper is available at additional cost. 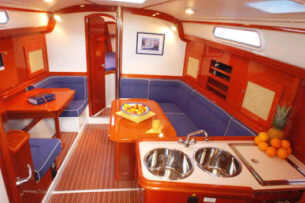 The Hanse 34 has three double cabins, one forward and two aft. The forward cabin has a large walk in area and plenty of storage room. There is one head with a shower located aft. The Hanse has roller reefing, wheel steering, VHF and an electric anchor winch. There is a swimming platform and deck shower, a dinghy, BBQ, AM/FM radio & CD player, fully equipped galley with LPG stove & oven, fridge, pre-charter cruising guides, full boat and chart briefing. Optionals include a skipper or a provisioning service.